May 2018. Optogenetics revolutionizes basic research in neuroscience and cell biology and bears potential for medical applications. A team of scientists from the Max Planck Institute of Biophysics, the Göttingen Campus and the Max Planck Institute for Brain Research have developed mutants leading to a unifying concept for the construction of various channelrhodopsins with fast closing kinetics. Due to different absorption maxima these channelrhodopsins allow fast neural photoactivation over the whole range of the visible spectrum. The scientists focused their functional analysis on the fast-switching, red light-activated Chrimson variants, because red light has lower light scattering and marginal phototoxicity in tissues. The team showed paradigmatically for neurons of the cerebral cortex and the auditory nerve that the fast Chrimson mutants enable neural stimulation with firing frequencies of several hundred Hz. These Chrimson mutants drive spiking at high rates and temporal fidelity with low thresholds for stimulus intensity and duration. 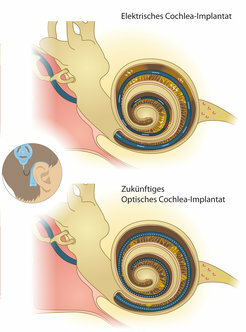 Optical cochlear implants restore auditory nerve activity in deaf mice.This demonstrates that the mutants facilitate neuroscience research and future medical applications such as hearing restoration.